Please enter your phone number so that we can respond to your inquiry. It is voluntary to provide your phone number, but if you do not, we will not be able to contact you. The personal data administrator is PCC Rokita SA with its registered office in Brzeg Dolny (Sienkiewicza Street 4, 56-120 Brzeg Dolny). You can contact our Data Protection Supervisor by e-mail: -MB-aW9kLnJva2l0YUBwY2MuZXU=-ME-. which you can decline), or action on your request, before concluding a contract – depending on the content of your message. The recipients of your data may be companies that support us in communicating with you and help us to run a website, external consulting companies (including legal, marketing and accounting companies) or external IT specialists, including entities from the Grupy PCC. Innovative solutions are a reaction to a changing world, responding to people’s new demands. Do you value your time and money? Are you independent and looking for unorthodox solutions? Residential Homes constructed from two 40-foot High Cube shipping containers. If you are curious about interesting solutions , and you want to stand out from the crowd and save money, we have a home perfect for your needs! MagaHomes - Your home at your fingertips! See VERSION A - with one bedroom. If you are curious about interesting solutions, and you want to stand out from the crowd and save money, we have a home perfect for your needs! See VERSION B - with one bedroom. 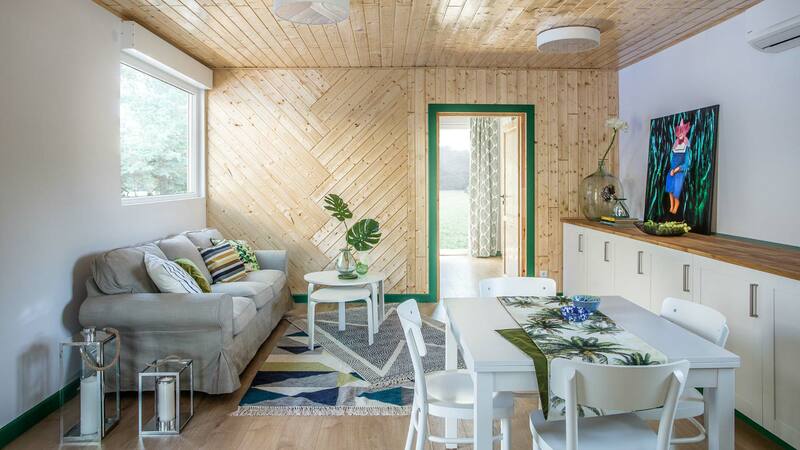 MagaHomes is a new brand for all-year-round and seasonal residential buildings constructed from shipping containers. We create fully-furnished module homes, which guarantee comfort, safety, and quiet, because we know that this is what you expect from your home! You don't have to worry about finishing and furnishings. We'll do it for you! Move your home wherever and whenever you want. Save money and fulfil your dreams. Conjured up from waste… We build a MagaHomes house from shipping containers which are no longer in service. We have processed them into light and spacious homes. There is a lot of daylight, but also a specific climate. Innovative solutions are a reaction to a changing world, responding to people's new demands. How do MagaHomes connect the containers together? Is there running water for them on-site? What insulation was used in the MagaHomes houses? Do MagaHomes container houses require foundations? How do you repair damage to the anti-corrosion coating on the container frame or in places where corrosion has occurred? Is it possible to move/transport MagaHomes houses and if so, how is this done? What are the standard dimensions of the containers used in the construction of MagaHomes houses? Are the dimensions of containers subject to certain standards? Is it possible to order a MagaHomes house for an individual order? How much does transporting the container cost, together with the preparation of the ground? Is additional heating of the container recommended during winter? How is water and other media connected to the container? Are the containers earthed? Is a lightning rod or other protection against lightning required? Is it possible to put facades on the container? The containers are bolted together via the corners, hence upper and lower corner). The advantage of connecting the containers in this way are the totally invisible assembly elements. A very important factor here is connecting the roof section of the containers. In MagaHomes houses, the roofs do not get stuck at the connection point, due to the use of a special roofing membrane. After insulation of the connection point and insulating the whole roof surface with polyurethane foam, we stretch the aforementioned membrane onto the roof and then we mount it with the aid of screws to the upper parts of the bolted container’s edges. The fixing screws are remain hidden under special masking, which also functions as a gutter. Such solutions not only safeguard against water (in the form of rain and snow) but also allow easy disassembly (and reassembly) of the roof when moving the container. For insulating MagaHomes houses technologically advanced insulation polyurethane is used, in rigid polyurethane tiles of varying thicknesses, depending on the type of surface being insulated. This type of insulation, apart from its excellent thermal properties, works excellently as waterproofing or as acoustic insulation. Their additional advantage is resistance to pathogens, which include fungi, insects, and rodents. Roofs – external polyurethane insulation in the form of rigid PUR tiles with a thickness of 20cms. Walls – internal polyurethane insulation in the form of rigid PUR tiles with a thickness of 15cms. Floor – internal polyurethane insulation in the form of rigid PUR tiles with a thickness of 10cms. We propose two methods of laying down the foundations of MagaHomes houses. Level the surface area to one level (levelling the ground) on which the house is to be situated, and then stabilise the ground with a compactor. For the next step, it is best to lay concrete slabs on the support points. This solution is best for people or companies that often change the location of the house. It doesn’t require devoting more time and incurring high financial costs. Pour reinforced concrete (to the frost line) at the support points. This method eliminates the action of the ground (e.g., through the ground being raised by frost) on the normal foundations of the container house. Clean the corroded area mechanically with a brush, and then repaint the area. MagaHomes recommends anti-corrosion restoring paint, designed for painting containers, called Metal Unicoat (this paint does not require a primer undercoat). The surface area may be painted by using a brush or roller. The container is equipped with appropriate handles to facilitate fixing, handling, and reloading. Transport of containers on the roads is carried out with lorries, usually consisting of two parts – a tractor unit and a container trailer. A trailer of this type is a special steel frame structure equipped with special plugs for fixing containers. The 40-foot HC shipping container – adapted to be a residential unit – weighs 7 tonnes. Its loading onto the lorry takes place by suspending it under the lower, corner cubes, using a crane. IMPORTANT: When loading a container, pay special attention to the crane’s lifting capacity (a minimum of 7 tonnes). A forklift truck can be used to move the container on the ground (the container is equipped with specially adapted pockets located in the lower part of the frame). Internal dimensions of the 40-foot High Cube shipping container: length: 12.032 m; width: 2.35 m; height: 2.7m. There are many different types of container. All, however, are subject to universal standards defining their dimensions, construction, strength and durability, maximum gross weight, and identification. Currently MagaHomes offers 4 ready-made, spatial solutions. Each of them is a comfortable, modern, safe, and aesthetic all-year-round or seasonal container house. You are welcome to look at our offers! It is clearly a difficult task to determine how much the total cost of transporting containers will be. The assessment of transport and ground preparation costs is always done on an individual basis and depends on many factors, e.g., the location of the investment and the cost of renting a lorry and crane from the local service provider. It is not necessary. High-performance, polyurethane thermal insulation used in MagaHomes houses protects it against heat loss. It is an economical and ecological solution. It is worth mentioning that a similar situation occurs in the case of high temperatures. Polyurethane insulations ensure not only warmth during the cold winter days, but also a pleasant cool temperature during the hot summer. All MagaHomes houses have an individual water connection, a sewage outlet and an external electricity supply. This makes it easy to disconnect the media and transport the container to another location. External connections are protected against freezing by appropriate thermal insulation. Earthing is absolutely required. If it is not available, the earth leakage circuit breaker will not work. A lightning rod is required for smaller buildings, but only if the lightning threat indicator exceeds 0.0001. When the indicator is lower, a lightning rod is not required. Adding a facade to the containers is very possible. The appearance of a MagaHomes house can be changed without any obstacles. The finishing options are endless: wooden planks, slate, fibre-cement tiles, and other materials. The houses are solid, which from the outside look very good in a raw state. Their facade can also be designed according to your own tastes and individual needs. One should clean the corroded area mechanically with a brush, and then repaint the area. MagaHomes recommends anti-corrosion restoring paint, designed for painting containers, called Metal Unicoat (this paint does not require a primer undercoat). The surface area may be painted by using a brush or roller. All MagaHomes houses have an individual water connection, a sewage outlet and an external electricity supply. This makes it easy to disconnect the media and transport the container to another location. External connections are protected against freezing by appropriate thermal insulation. The photos below illustrate our solution. The MagaHomes showroom is open from Monday to Friday, from 08:00-21:00. Please contact us to book a demonstration! Innovative solutions are a reaction to a changing world, answering people's new demands. Do you value your time and money? Are you independent and looking for unorthodox solutions? The message has been sent correctly. We will contact you as soon as possible. Please enter your e-mail address to subscribe to the newsletter. Providing your e-mail address is voluntary, but if you do not, we will not be able to send you a newsletter. The personal data administrator is PCC Rokita SA with its registered office in Brzeg Dolny (Sienkiewicza Street 4, 56-120 Brzeg Dolny). You can contact our Data Protection Supervisor by e-mail: -MB-aW9kLnJva2l0YUBwY2MuZXU=-ME-. We process your data in order to send you a newsletter – the basis for processing is the implementation of our and third parties’ legitimate interests – direct marketing of our products / products of the PCC Group. – lodge a complaint to the President of the Personal Data Protection Office.